To purchase this book, click below. Sustainability has become part of our collective world view in recent years. As such, a new map is needed to navigate the dynamics of change in the making of cities, buildings, and products. Sustainometrics© represents a way to describe the interconnectedness of five domains of human activity—environmental, socio-cultural, technological, economics, and public policy—and their interplay with regard to achieving the goals of sustainability. Taken together, the Five Domains of sustainometrics can guide holistic solutions, balancing human needs with the depletion of natural resources. JISC has developed a Sustainometrics© website incorporating use of the EcoSTEP® tool for measuring sustainability. You can visit the website here: www.sustainometrics.org. 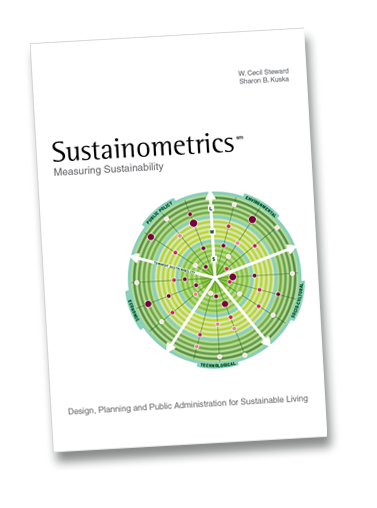 Joslyn Institute Founder, President and CEO, W. Cecil Steward, and Joslyn Institute Vice-President, Sharon S. Baum Kuska, have published the seminal book, Sustainometrics: Measuring Sustainability – Design, Planning and Public Administration for Sustainable Living. Steward and Kuska present a method to define progress toward sustainability goals in the form of the EcoSTEP™ tool. EcoSTEP™ can be applied at any scale of design, planning, or sustainability problem-solving. This method has been effectively used in pre-design programming, neighborhood and regional assessments, post-occupancy evaluations of industrial buildings, and comparative analysis of similar buildings. Altogether, the process will result in better, conservation-based decisions and the avoidance of many unintended consequences suffered through past trials and errors of judgment about the livable conditions we all desire. “Sustainometrics™ offers us an optimistic view that our individual choices matter greatly and we can make a difference,” said Phil Enquist, partner in charge of Urban Design & Planning at Skidmore Owens and Merrill. Sustainometrics: Measuring Sustainability has been incorporated into the curricula of schools in the United States and is being translated for use by students in China as well. For author interviews, and speaking engagement inquiries, contact Jane Gaboury, Greenway Communications, jgaboury@greenway.us, (678) 879-0929. © 2016 Joslyn Institute for Sustainable Communities. All rights reserved.